The key to the construction and operation of Edwards's space elevator are the mechanical climbers. They will be required to deploy parallel cables and to transport additional countermass to the end of the space elevator, and then to transport people and cargo from Earth to space and back (Fig. 6.4). In contrast to a launch with a rocket, riding up a space elevator does not require strong accelerations, does not impose violent vibrations, and does not involve a high risk of explosion. That means payloads can be built less robustly, can be launched fully deployed, and can be switched on while still attached to the climber. Testing shortly before detachment from the space elevator can identify problems, in which case the payload can be brought back down to Earth for repairs. A rocket launch allows verification only of the correct functioning of a spacecraft after release and the deployment of solar arrays and antennas, and does not allow a return in case of malfunctioning (except in the case of the Space Shuttle). Using conventional elevator designs, like those used in apartment buildings and skyscrapers, is not a good idea because the extremely long cables required to haul the elevators up into space would be extremely heavy and difficult to handle (as described before, they may be used to haul up countermass and heavy loads, but for transporting satellites and small amounts of cargo they would be overly complex). It makes more sense to equip the climbers with some kind of mechanism that grabs the space elevator cable and a motor enabling it to pull itself up. A commonly shown design involves two tracks, like on a tank, sandwiching the elevator cable between them. Moving the tracks simultaneously allows the climber to roll up and down the cable. The tracks will need to put a sufficiently high pressure on the cable to prevent the climber from sliding down, but on the other hand not squeeze so much that it damages the tether. Another issue is the speed of the elevator climber. The geostationary point, the most likely location for the main center of activity on a space elevator, is 36,000 km (22,000 miles) up. Covering that distance is equivalent to traveling almost once around Earth! A climber moving at 200 km per hour (125 miles per hour) will take over a week to get up to GEO, making it more like a very long train journey than a ride in an elevator. Figure 6.5: A capstan design for grabbing and moving a climber along a space elevator tether. As the vehicle will be moving through the Van Allen belts at relatively low speed, radiation is a very important issue if people are onboard. The Apollo spacecraft on their way to the Moon moved through the belts at 10 km per second (6 miles per second) and traversed them in half an hour. At 200 km per hour (125 miles per hour), however, a crawler will take about 90 hours to get through the radiation belts. In that long time passengers will accumulate some 100 rads of radiation, with acute radiation sickness as a result (500 rads is sufficient to kill you). Heavy shielding will be necessary for passenger crawlers, for example, with dense materials such as lead, but also thick layers of water in storage tanks surrounding the spacecraft will work. The benefit of using water is that it can afterward be used in the stations on the space elevator, as the water does not get contaminated by acting as a radiation shield (on the other hand, it may be needed again for radiation shielding on the return trip down). At Earth's surface, the space elevator cable and base station have a horizontal velocity of about 465 meters per second (1530 feet per second), due to the rotation of Earth. Up at the geostationary point, the space elevator has the local orbital velocity of 3.1 km per second (1.9 miles per second). The horizontal speed of each part of the space elevator ribbon thus increases with altitude proportional to the distance from the center of Earth; the further out, the faster it goes. As a payload is lifted up a space elevator, it therefore not only gains altitude but also horizontal speed (or "angular momentum''). The source of this speed is Earth's rotation; according to the physics law that describes the conservation of angular momentum, Earth will slightly slow down as the climber speeds up. However, since the climber's mass is insignificant compared to the mass of our planet, the effect on Earth's rotation is immeasurably minute. As the climber ascends, it is thus accelerating in a horizontal direction. That means it is constantly moving slightly slower than the point of cable that it moves onto, "dragging'' the cable slightly to the west. Depending on the speed of the climbers and the tension the countermass exerts on the cable, this can generate an amount of lean on the lower portion of the cable—on the order of a degree or so for Edwards's space elevator design. This should not be a problem, but too heavy climbers moving up too fast could drag the cable so far out of the vertical that the space elevator could become dangerously unbalanced. Mass and velocity restrictions will thus apply to the climbers allowed to move up the space elevator. Over the long distances that climbers will travel, reliability can be a problem; wheels with a half-meter (20-inch) diameter will rotate 64 million times getting all the way up a 100,000-km-high (62,000-mile-high) space elevator, and still almost 23 millions times to get to geostationary altitude. Wheeled vehicles moving at high speed normally need some maintenance before reaching 36,000 km on their clock, but repairs on the way up will be difficult. The level of confidence that a climber will make it at least to the nearest maintenance station (likely to be at an altitude of 36,000 km) will thus need to approach 100 percent. Space elevator climbers will thus have to be constructed for durability, using high-quality materials, robust mechanisms, and various backup systems. Electromagnetically suspended elevators, somewhat similar to the magnetic levitation (maglev) trains already in operation, would not touch the cable at all and therefore enable much higher velocities and experience lower wear and tear. However, such a system would be even more complex than a mechanical climber, mostly due to problems related to running electrical power up a 36,000-km maglev track without enormous line losses (maglev trains are propelled by an electromagnetic system in the guide rail instead of an onboard engine). But even a mechanical, relatively low-velocity climber system introduces a problem: how to power the climbing mechanism? The amount of total energy required is actually quite low. Where a rocket has to provide both potential energy ("height energy") as well as kinetic energy ("velocity energy''), a space elevator climber effectively gets its orbital velocity from the spinning Earth; it automatically attains the rotational, horizontal velocity of the space elevator as it climbs up. In theory, a climber would thus need sufficient power only to climb up to GEO altitude at a very modest vertical velocity. The decreasing level of gravity on the way up limits the amount of energy required for this even more. Some 50 cents of generated electricity per kilogram climber would theoretically be sufficient. In reality it will cost much more than that, due to energy losses in the climber's electric motors and because of friction between its locomotion mechanism and the space elevator cable. According to Edwards, each 20-metric-ton (44,000-pound) climber will require some 2.4 megawatts of power, roughly the amount of electrical energy needed to run 800 busy family homes. Equipping the climbers with solar arrays is also no solution, because they would need to be too large and therefore too heavy. At maximum theoretical efficiency, any solar array would be unable to provide enough power to move its own mass from Earth up the elevator, let alone the additional mass of the rest of the climber system. 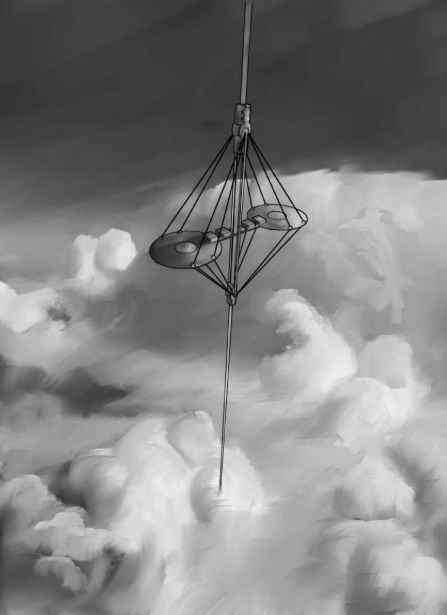 Using the movement of the space elevator tether through Earth's magnetic field to provide electrical power to the climbers (like an electromagnetic drag tether) does not provide enough power either. Nuclear reactors sufficiently light and compact to be installed on a climber do not exist and are not likely to be available anytime in the foreseeable future. The one practical way of getting power to a climber that space elevator designers currently focus on is beaming energy in the form of laser light from the Earth's surface. 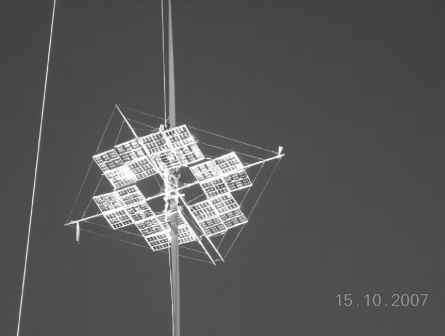 The climber receives the incoming light on a photovoltaic array (similar to a solar array), which converts it into electrical power for the climbing system's electromotor. Laser light packs much more power than sunlight and can be formed into a tight beam that does not disperse much even over very large distances. The equipment required to generate and send out the laser beam would be heavy and bulky, but that would not matter as the laser generator would be located on Earth at the foot of the space elevator. Powerful laser generators are already under development. An impressive example is the Airborne Laser, intended to shoot down ballistic missiles from onboard a heavily converted Boeing 747 airplane. The system uses a megawatt-class laser, aimed at a target by a large telescope in the nose of the aircraft. A smaller laser measures disturbances in the atmosphere and sends corrective signals to adaptive optics in the telescope, making it possible to accurately focus the megawatt laser onto a pressurized area of a boosting missile. 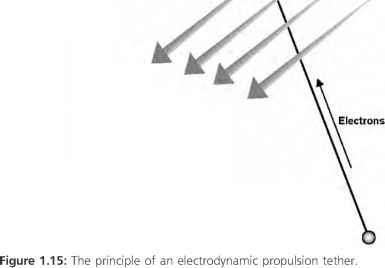 The heat from the concentrated energy will then cause the rocket to break apart. At the time of writing, the full system is to be demonstrated on a real flying missile in 2009. The weapon has an effective range of hundreds of kilometers (the precise specifications are secret), so its technology should be a good start for a space elevator laser energy beaming system. Space elevator climber technology development is actively supported by the Spaceward Foundation, which has been organizing the Space Elevator Beam Power Challenge every year since 2005. For this competition, participating teams design and build climber prototypes, which then have to race up a vertically suspended tether using only power beamed up to them from the ground. Developing a climber is not an easy task, as the designers have to find the right mix of lightweight structure, efficient motors and traction mechanisms, efficient photo-voltaic arrays, and effective thermal control and other equipment. In addition, they have to provide a sufficiently powerful system for beaming the required energy to the climber. "In broad strokes, the goal of the Space Elevator Games is to bring the Space Elevator closer to reality,'' the Spaceward Foundation writes on its website. "The goal of the power beaming challenge is to promote power beaming technology. We think that the time is ripe now to move the competition to the next level, addressing real-world power beaming scenarios where the minimum requirements for such systems start at the kilometer range and kilowatt power levels.'' Apart from furthering space elevator development, the competitions are also intended to inform the public about space elevators and demonstrate to them that it is more than merely science fiction. The objectives for the 2008 competition are climbing a tether of 1 km (0.6 mile) in height, at a minimum speed of 2 meters per second (6.6 feet per second), carrying as much payload as possible. A high performance prize will be awarded to teams that can move at 5 meters per second (16.5 feet per second) and faster. The climber's net weight is limited to 50 kg (110 pounds). There is no limit set on the amount of power beamed up; the competitors are encouraged to build the most powerful beaming system they can devise. The foundation provides the tether, which is suspended below a balloon that is kept in place by three anchor cables. The rating for each climber is calculated as follows: speed multiplied by the amount of payload, divided by the net weight. For example, a 30-kg climber carrying 10 kg of payload at an average speed of 3 meters per second will have a score of 1 (3 times 10 divided by 30). The prize money, for the 2008 competition a total of $2 million, is provided by NASA's Centennial Challenges program. NASA has pledged to sponsor the Space Elevator Games from 2005 through 2010 with a total of $4 million. The Spaceward Foundation has been slowly increasing each year's prize money, in line with the growing difficulty level of the challenges. In 2005, for the first competition, only a handful of teams participated in Mountain View, California. Back then the goal was to climb a 50-meter (160-foot) ribbon using a power source, in the form of a searchlight, provided by the organization. None of the climbers went up fast enough, so the NASA-provided prize money stayed in the purse for 2006. For the second edition of the event, the teams had to bring their own power source. Searchlight, laser, microwave, and sunlight concentrating mirror (heliobeaming) systems were put at the bottom of the ribbon, but only five climbers made it all the way up the 50-meter (160-foot) course. The Canadian Team USST from the University of Saskatchewan came within 2 seconds of claiming the prize, but again no money was awarded. In 2007 a leap in the technology was applied, with two of the 22 teams putting together laser-based systems complete with automated tracking and ground-to-climber data links to scale the 100-meter (330-foot) tether. The overall winner was once again Team USST from the University of Saskatchewan, which managed to move its laser-powered 25-kg (55-pound) climber at an average velocity of 1.8 meters per second (6 feet per second). Moreover, the team did this four times within 40 minutes, demonstrating the reliability of its design. Team Kansas City Space Pirates demonstrated the fastest short climb, moving at over 3.5 meters per second (11.5 feet per second) using only directly reflected sunlight. Unfortunately, its climber was later damaged by a wind gust and never regained its full power. In spite of the impressive successes, in this third event again none of the teams reached the threshold necessary to win the prize money (Fig. 6.6). (0.6-mile) tether used for the 2008 event represents a major leap in complexity; not only is the climb much longer, but the beaming of sufficient energy to such a high altitude is much more difficult. To enable teams to participate financially, laser companies sponsoring the 2008 competition will supply the equipment necessary to beam sufficient power to the competing climbers. In parallel with the Space Elevator Beam Power Challenge, the Spaceward Foundation organizes the Tether Strength Competition. For this, teams have to provide a closed-loop tether of at least 2 meters (7 feet) in length, weighing no more than 2 grams (0.07 ounces). The tethers are put under tension until they break. For the 2008 competition, the foundation awards a total of $1 million of NASA-provided prize money to the teams with the best space elevator tether sample, under the condition that they can beat the best commercially available tether by a factor of two. That means that the 2-gram tethers need to be able to handle a force of over 8000 newton (equivalent to a suspended load of 800 kg [1800 pounds]). Provided that all the challenges with nanotube materials, power transfer, and climbing mechanisms are solved, what would a ride up a space elevator be like? For a start, it would be completely different from the bone-rattling trip into orbit onboard a conventional rocket. That typically takes 8 minutes from lift-off to low Earth orbit, during which passengers experience acceleration forces of three times their weight or more, followed by an instant, stomach-churning switch to zero gravity. In contrast, climbing a space elevator could take weeks but would be extremely benign on the body (providing there is sufficient protection from radiation). Inside a sufficiently comfortable "wagon," the journey would be spectacular yet elegant, something like a holiday cruise into space rather than the adrenaline kick of a rocket flight. Going up, for the first 10 km (6 miles) or so, the world beneath would look like what you see out of the window onboard an airliner. However, a couple of kilometers higher, Earth's curvature would become noticeable, such as is seen from the cockpit of a high-altitude fighter jet or spy plane. At an altitude of around 50 km (30 miles), the sky would turn black and, looking away from the Sun, the stars would become visible during daytime. Most of the atmosphere would already be below the climbing vehicle. At 150 km (95 miles), Earth would appear as a partial sphere. At 350 km (220 miles), passengers would feel a bit light on their feet as gravity is a noticeable 10 percent lower than on Earth's surface. The 50 percent gravity level would be crossed at around 2600 km (1600 miles), about 13 hours into the trip if the climber moves at a speed of 200 km per hour (125 miles per hour). Things falling out of the passengers' hand take 40 percent more time to hit the ground than on Earth's surface. At an altitude of 36,000 km (22,000 mile), which would be the geosynchronous orbit stop, passengers would be floating around in microgravity conditions, looking at an Earth the size of a baseball held at arm's length. The lower gravity levels are a result of Earth's gravity decreasing with altitude, and a small contribution of the centrifugal force caused by the rotational velocity on the space elevator (which increases with altitude). The gradual reduction of gravity experienced while going up a space elevator may reduce the number and severity of "space sickness'' cases. Space sickness feels a lot like the motion sickness one may experience on a boat. About two out of three astronauts suffer from it, while one in seven will even experience severe nausea and vomiting. The discomfort usually starts early after arriving in orbit (onboard a rocket), and it normally takes a couple of days for an astronaut to adapt. A person inside a space elevator climber may lose the space sickness symptoms during the journey up, and be fully adapted by the time he reaches zero gravity conditions at the geosynchronous orbit station. Another interesting possibility offered by the gradual change in gravity is the simulation of gravity levels at other planets and moons. In a station placed about 4000 km (2500 miles) high up the space elevator, passengers would experience Mars gravity conditions, at 38 percent Earth gravity. At an altitude of 9000 km (5600 miles), the gravity level would be that of the Moon—a sixth of that on the Earth's surface. In such stations astronauts could train for interplanetary missions, or recover from long-duration missions spent in low- or zero-gravity conditions. A space elevator would make it possible for them to slowly reacclimatize to Earth's gravity before descending further to the surface.